Home > News & Events > Why Consider Tool Transfers? We offer fast and simple transfer of metal stamping tools and dies to Bahrs Die and Stamping through our Tool & Die Transfer Program. • In order to provide an accurate tool or die transfer estimate, we will need to obtain as much information as possible. • Please submit the requested documents to Bahrs Die and Stamping to receive a tool or die transfer quote. • If possible, ship existing die to Bahrs Die and Stamping. Bahrs will inspect and evaluate the die as soon as it is transferred. If permitted, Bahrs may also review the tool at the current supplier. Some cost may apply. Our engineers will inspect the transferred die to evaluate the die condition, any needed repairs or modifications. • If it is not possible to obtain the existing die from the current supplier, Bahrs Die and Stamping will discuss the initial cost to build a new die. In many cases a new die can result in improved part design, quality, performance, production time or other cost savings over the transferred tool. Depending on the total parts to be produced, there may be special considerations. o Based on our inspection, Bahrs Die and Stamping will provide a detailed condition report with any recommendations. (In some cases, the best solution may be building a new die) The report will include associated costs for resulting recommendations. Advance planning helps to ensure a successful tool transfer, production start-up and avoidance of manufacturing delays. 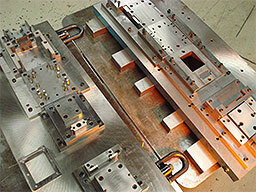 When necessary, Bahrs Die and Stamping can handle the die transfer in a matter of days. Again, in order to provide a timely and accurate tool transfer estimate we need as much upfront information as possible. It is helpful for us to receive as many of the following documents as possible.